The sun's magnetic field is in the process of reversing its poles, so that what was the north magnetic pole becomes and south and vice versa. This is nothing new and it happens every 11 or 12 years. This reversal generally marks the high or peak of the solar (sunspot) cycle, with increased solar activity and flares building up to this reversal, and an equal amount of solar activity after the reversal as the solar cycle goes into decline. This is happening now and will complete itself in the next several months. This reversal phenomena was only discovered in 1955, so it is still relatively new and not fully understood. It is clear to scientists that the solar reversal has far-reaching effects in the solar system, but not so clear how it effects those of us here on earth or whether we can be very much aware of it impacting us personally. However, this reversal will take place in the next few months, so we each have a chance to be an observer and see for ourselves. One unusual effect of the current reversal (not normal) is that the north solar magnetic pole is already in reversal (and pointing south), while the south magnetic pole is not moving yet. Usually they move together. Who knows what that could mean. One fact to keep in mind is that during solar maximum (like we are in now), the sun very much dominates the solar system, acting like a shield or umbrella to keep out cosmic ray particles coming from distant parts of our galaxy and beyond. 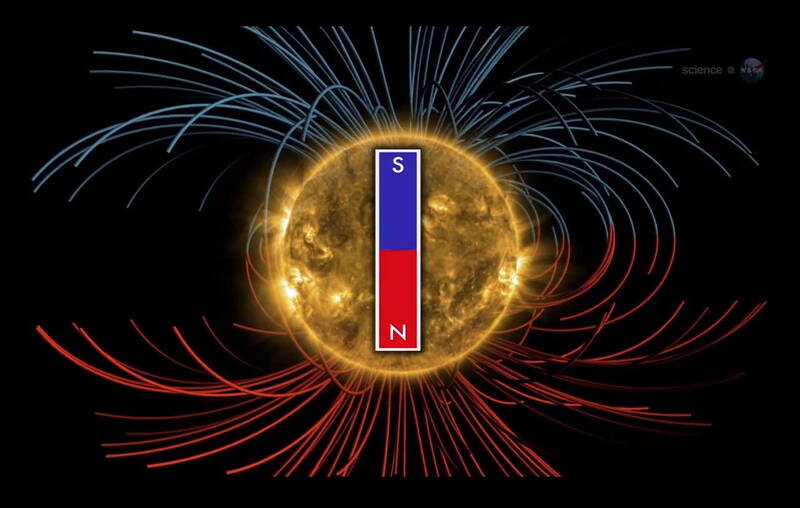 At solar minimum (5.5 years from now), the sun's magnetic shield will be weaker and cosmic-ray particles will be more able to enter the solar system (and thus reach Earth) much easier. The polarity of the Sun at any given time determines the entry point of cosmic rays into the heliosphere and our solar system. Our Sun's heliosphere extends 50 to 100 astronomical units beyond the orbit of Pluto, which is an almost unimaginable distance. This polar reversal is slow and complex, typically taking months for the reversal to fully propagate. Does it affect us? It certainly does, but probably it is too vast a phenomenon for us to register it easily. We would have to be very subtly aware to measure it with our mind, but perhaps we can. I just don't know, but I will keep an eye out. What we do know is that we feel the solar effects more strongly now than we will for another 11+ years, and that external effects or information from outside our solar system (like from the galaxy) will reach us less than at any other time. On a personal note, putting aside this solar magnetic reversal, and just looking at my own life, although personally I may not be sensitive to this reversal, it is true that my own little world is flipping upside down just now as I let go of a business I created almost 40 years ago, offload my very large astrological library, and begin to wander into the world of (essentially) being retired. To quote a line from a song by my good friend Luke Winslow-King, I am "tired as a retiree." I don't know about being tired, but I am finding that being retired is not like a switch that you just turn off, but more like another adventure you have to live. And like life, it too has waves, tides that wash over me, pushing me first into the future, and then just as quickly rushing in the opposite direction, pulling me back into the past, and here am I, caught between the two, a little twig floating in my stream of life. What do I think about retirement? I think this will take some reflection and observation on my part to make sense of it all, to make hard contact. Suddenly, in many ways I am free, free to leave behind some burdens, but also free to just leave. And that freedom leaves room for pause, like Hamlet's soliloquy. Where will I go, what will I do? I am leaving of my own free will, right? I am reminded of this short poem by my favorite poet, Gerard Manley Hopkins.